7 Days! Are you ready for Christmas? I’m not. Not even close. I don’t have a single gift wrapped, & only a few bought. Cards aren’t mailed (but they are at least on their way to me), & envelopes aren’t addressed. So what did I do today? Made cookies, of course. Two years ago, I had a great gift idea for my mom. She worked in a school cafeteria for years & had mentioned several times since she retired how much she loved the commercial grade KitchenAid mixer she used at work. So I rounded up my dad & brother to go in on it with us, & we got her her very own KitchenAid mixer for Christmas. Little did I know, she had already had the same idea – for me! My dad was the only one who was in on both plans. Pretty sneaky, Dad. These Iced Oatmeal Cookies from Mother Thyme were the first thing I made with my shiny new mixer. (It’s still pretty shiny – it’s my other baby & gets a lot of TLC!) You know those iced oatmeal cookies you can buy at the grocery? We bought the Walmart brand for years (shhh!). These cookies look just like those, but they are so. much. better. 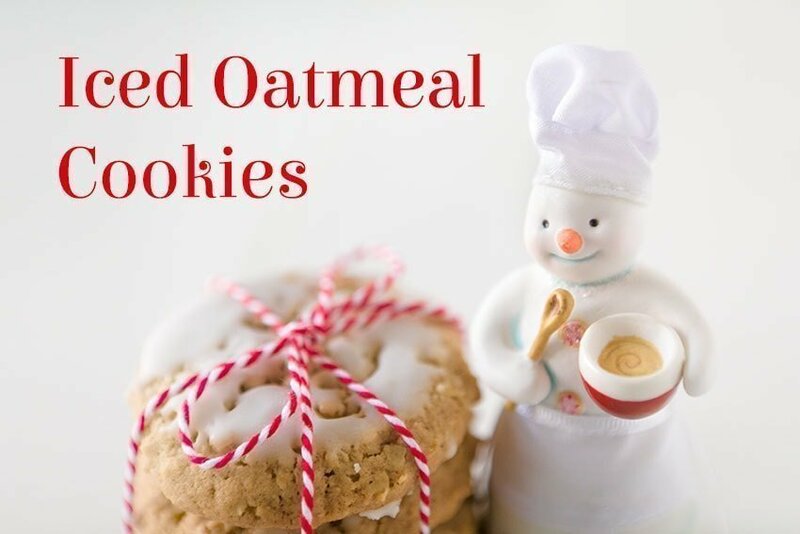 The key to these cookies is not to grind the oats up too much. We have made these several times now, & they’ve always turned out perfectly. But wouldn’t you know, the one time I make them to photograph, I grind the oats too fine & the cookies don’t spread like they should. So don’t be like me – follow the directions and only pulse the oats a couple of times! My assistant doesn’t seem to mind – she thinks they look pretty tasty anyway. I think she loves the KitchenAid almost as much as I do. The splatter shield makes it easier for her to use without slinging ingredients everywhere, which is a big plus! Here she is demonstrating how to add the eggs & vanilla to the butter & sugar. But she is pretty fond of hand mixing, too, especially when wooden spoons or whisks are involved. She was careful to get all the dry ingredients (oats, flour, salt, soda, baking powder, & cinnamon) all mixed together. She takes her cookie baking very seriously. This recipe should give you a solid 4 dozen cookies, using a 1/8 cup cookie scoop. I pay a cookie dough tax to my assistant, so I ended up with 47 cookies. After baking, cool the cookies completely on a wire rack before dipping in the glaze. The glaze will be nice & thick – drop the cookie in upside down, mush it down into the glaze a little, & pull it out, letting the excess drizzle off before flipping the cookies over & putting them back on the rack to let the glaze dry. If you want to add sprinkles, now is the time to do it, while the glaze is still tacky. The glaze should dry hard enough that you can stack the cookies for storage. My assistant also charges a fresh cookie tax. I hope you enjoy these cookies as much as we do! I have plans for a version that includes ground up raisins, if I can talk the assistant into it. She wrinkles up her nose at the very thought, but if I can convince her, I’ll let you know how they turn out! For more Christmas cookie fun, follow the blog circle over to Jennifer Carr’s blog to see what she is whipping up for the holidays. Preheat oven to 350° & line baking sheets with parchment paper. Pulse oats briefly in a food processor, just to break them up a little. Do not over process, or your batter won't spread! Cream butter & sugars together until fluffy. Add eggs one at a time, beating until combined after each addition. Add vanilla & continue to beat until combined. Add dry ingredient mixture a little at a time until fully combined. Using a 1/8 cup cookie scoop, place batter on lined cookie sheets, about 12 balls per cookie sheet to allow room for spreading. Allow to cool on cookie sheet for a few minutes, then transfer to a wire rack to cool completely before icing. While the cookies are cooling, mix powdered sugar and milk with a fork until smooth. The glaze will be very thick, like a paste. When cookies are completely cool, dip each cookie into the glaze, shaking the excess off, and return to wire racks or paper towels to let the icing set up. * The original recipe also calls for 1/2 tsp nutmeg, which I left out because I don't like nutmeg!